At St. Scholastica, we understand the college experience is more than just what happens in the classroom. It’s everything that goes into preparing you for a life of purpose and meaningful work. Here's a sampling of the curricular, co-curricular and extra-curricular undergraduate experiences you'll find at St. Scholastica. At St. Scholastica, challenging academics is crucial to the college experience. We inspire student success by stressing the importance of academic effort and establishing high expectations for student performance. St. Scholastica's high scores on the National Survey of Student Engagement (NSSE) — a widely respected evaluation of collegiate quality — affirm our educational excellence, exceptional faculty, supportive academic environment and diverse, inclusive community. More than 60 percent of undergraduate students participate in experiential learning, such as internships, field experiences and research placements. Plus, the campus boasts a newly renovated, state-of-the-art science center with 13 labs and one of the nation’s few undergraduate donor body anatomy labs. The St. Scholastica experience is distinguished by the school's Catholic Benedictine ethos, or animating spirit. Students experience this in the customs, practices and aspirations of campus life. 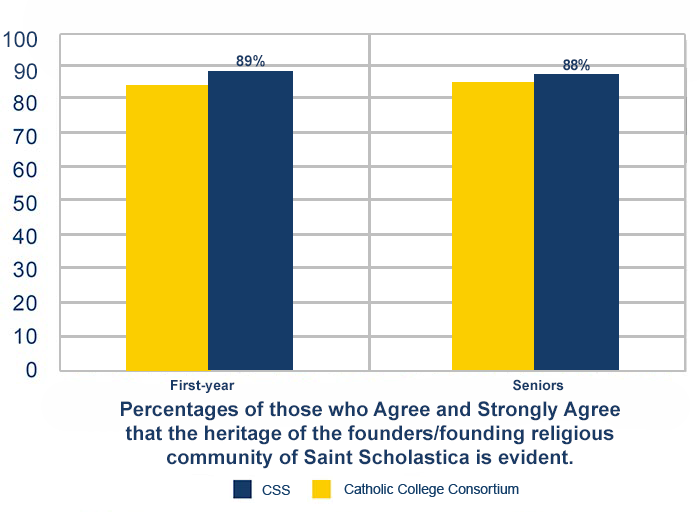 This is evident in the following survey from the NSSE 2013 Catholic College Consortium study that measures mission effectiveness. Every year, nearly 10 percent of undergraduate students participate in St. Scholastica’s more than 10 study abroad programs. The college is a member of the Higher Education Consortium for Urban Affairs (HECUA), which gives students the opportunity to travel to almost any country in the world. Through program review and feedback from employers, alumni and students, we regularly assess the usefulness of our curricula to students who will live and work in a global, diverse and technological society. A leader in healthcare education for more than 100 years, St. Scholastics also boasts one of the largest nursing schools in the Midwest. In 1935, St. Scholastica created the first accredited medical records undergraduate program, the forerunner of health informatics and information management (HIM), and established the first HIM graduate program in 2001. Home to the Mitchell Auditorium, a premier performing arts center, St. Scholastica hosts speakers, concerts and performances aimed at exploring big ideas, finding your place in the world and celebrating art in all its forms. The Theater Department has three performances every year, and the Music Department offers numerous ensembles open to students of all levels. We strive for all students to feel welcomed, respected, supported and valued. Our Intercultural Center, an extension of the Office of Diversity and Inclusion and home to several student clubs, is a vibrant hub where students gather to network and have fun in a supportive atmosphere. St. Scholastica is the second Minnesota private college to create a cabinet-level position to lead inclusion and diversity efforts. We also offer a cultural competency certificate program to prepare students to live and excel in a diverse world. Our more than 60 student organizations, including everything from student senate and political groups to sports clubs, service groups and a campus newspaper, foster self-confidence, leadership and respect for others.